At the unveiling ceremony for a monument built to honor the victims of an unexploded ordnance explosion that occurred at Saint Matthew kindergarten, pupils paid tribute with flowers. At the kindergarten yard of Saint Matthew kindergarten in Tomishiro on March 2. On March 2, 1974, during the construction of a side ditch close to Saint Matthew kindergarten in Oroku, Naha an unexploded ordinance exploded, killing four people, including students, and injuring 34 people. The explosion occurred during an annual Doll Festival held at the school. 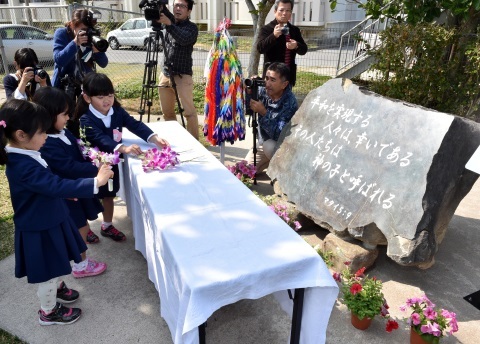 On March 2, a ceremony to mark the unveiling of a monument to the incident was held at the kindergarten, which was moved to Tomishiro in 1989. About 70 people, including 20 kindergarten pupils took part. This year marks the 50th anniversary of the kindergarten’s founding, and the 70th anniversary of the end of World War II. The people involved began preparations to build the monument two years ago.